Young Bradon McTavish watches the bluecoats brutally hang his father and destroy everything he's known, and he escapes their wrath into the gun smoke and blood of war. Captured and paroled, only if he'll head west of the war, he rides the river into the wilds of the new territory of Montana where savages and grizzlies await. He discovers new friends and old enemies, and a woman formerly forbidden to him. This was a historically correct book basically. I have issues with some of the things told but the author can only write from his perspective. he never will ever know what it is like to be of a different race or even a mixed race. But the things that were told and the journey that was shown was one that makes all western stories come alive to me. I would not say it was as accurately correct as a Louis Lamore book but it came close. The narrator was well chosen for this type of book and did a good job. I will search out more books that he has narrated and also find more books by this author. I got this book via audiobook boom. What does Bob Rundell bring to the story that you wouldn’t experience if you just read the book? Would you consider the audio edition of West of the War to be better than the print version? I enjoy reading a good story better than listening but with my limited time for reading ,listening while driving is very enjoyable. What was one of the most memorable moments of West of the War? The Historical accuracy about the civil war prison camp impressed me.Did enjoy the Union redheaded Lt getting shot with buckshot. Which character – as performed by Bob Rundell – was your favorite? When the Union hanged his father was a moving and touching moment.When the author described the condition of the hanging body of his father was moving. I did not like the authors choice of racial mixing the characters.I think this was thrown in much like the way commercials display racial mixed couples in almost every commercial shown on television today. That seems to be the popular agenda today but Historically that would not have happened as portrayed.That would be the only negative for me that I found with the story. Interesting, well written, entertaining and engaging story. The journey across the country (1864) around/during the time of the civil war was not an easy task. The story pulls you into the journey and you feel like you are right there with them in the middle of the action. This story is a period piece. It stays true to language used in that time period so if you are offended by words that were used for the time period you may want to skip this book. It is part of history and that fact cannot be changed. If the author had used the terminology we use today it would not have worked in this story. I personally prefer my stories to be historically correct. The story follows Brandon McTavish through his life altering journey of being a slave owner, to fighting in the confederate army, to being paroled, reuniting with his former slaves and the circumstances that alter his journey to travel west which was a condition of parole. Brandon's character changes and evolves throughout the story. It was interesting seeing his character slowly going through the changes to become the man he is at the end. Did not like that the story abruptly ends. Would have liked to have an epilogue. This is the first time I have listened to Bob Rundell narrate a book. He has a very deep gravelly voice that was perfect for this story. Clearly spoken. Nice even pace with the delivery. Good character voices. The pace of the narration fit the story and the characters. He was able to make the characters and the story come to life. Enjoyed this book, will listen to the others. 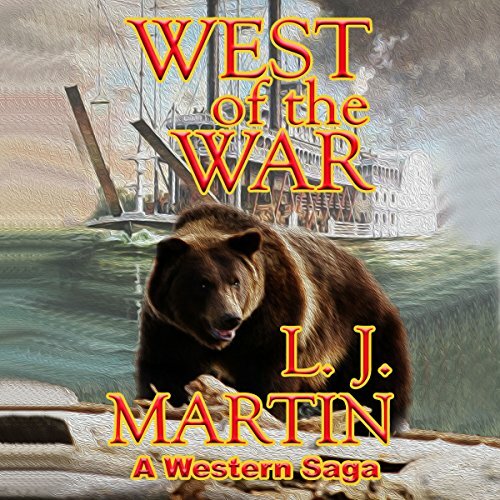 A historical western fiction that begins during the Civil War and continues into the westward movement. This is the first listen of this author. A lot of great description of scenery and characters. Adventure and action keep the listener entranced. This wasn't my favorite of this time period but not bad. The narration was slow and drawling but speed up on Kindle made it tolerable.The characters were well portrayed by Bob Rundell. Great Story -- Well worth a credit! What made the experience of listening to West of the War the most enjoyable? The main characters were complex but likeable, The story was the best western I've read in a while. The author dealt with the complex feelings of southerners during and after the War Between the States very well. What other book might you compare West of the War to and why? I would compare this to one of the Louis LaMour sagas or the Big Fifty which are great stories and I didn't want them to end. This was also pretty historically accurate. Have you listened to any of Bob Rundell’s other performances before? How does this one compare? I think this is the first but I thought he did a great job. I loved this story and didn't want it to end -- I will seek out more of his books. I was given this book free in exchange for an unbiased review through Audiobook boom. Makes a long road trip short! This story puts you back in time, and helps you apprieciate how easy life is today. Solid story with believable characters. the story was easy to follow even with the rough performance.